This past weekend I took my kids to Kidsfest, which took place at The Forks, in Winnipeg. I had some extra tickets so we invited my sister and my niece (my daughter's BFF). We couldn't have asked for a better day. The weather was perfect and the crowd was manageable. The organizers did a great job of spreading out the tents all around The Forks. The very first thing I saw when I got there, which I think is genius, is a bike and stroller valet. Stroller Valet!!! Genius! So simple yet so helpful! And the staff at the ticket booth were so nice. In fact, the staff at all the tents were exceptional! What I learned while I was there was that Kidsfest relies heavily on volunteers, donations and sponsorship. Ticket sales on covers a fraction of the cost to run Kidsfest. You couldn't have asked for better volunteers. The enthusiasm and energy was seen all around! First up, face painting. You can't attend Kidsfest without getting your face painted. We watched a performance from Order & Choas! Comedy, Music & Bubble Majic! The girls loved it! Then we did crafts, which was the highlight of my day.... I mean the girls day (okay for those that don't know me, I kind of have a thing for all things crafty). My sister was helping the girls with the crafts while I took care of my baby boy (and I played photographer too). Another hit was Kindermusik! I had to drag my daughter out of that tent! 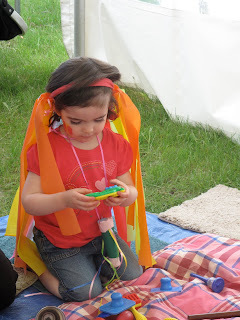 This was her favourite part of the festival. My niece loved playing with all the instruments too! What's a festival without dressing up? My daughter wouldn't stop talking about Kidsfest all weekend, which means it was a hit! There is so much to do there. It really is a festival that kids of all ages would enjoy. Looking forward to next year. You may just see a momstown tent there?!?! Saw this site on my FB feed from Koba Entertainment!